Republicans with the House Permanent Select Committee on Intelligence Tuesday submitted a motion to immediately publish dozens of witness transcripts in the Russia Trump investigation that were turned over for declassification review, stating it is “part of the process of publishing them for the American people to see.” Though the transcripts are unclassified, the Committee had sent them to the Intelligence Community for a review as a precautionary measure. Let’s do it. Make the witness transcripts public and let the cards fall where they may. The committee already voted to make the documents public on a similar motion in September, 2018, when it was then led by House Republicans. The Republican motion was in response to now Democratic Chairman Adam Schiff’s proposal to turn over all the witness interviews to Special Counsel Robert Mueller’s office for review. Those witness interviews, however, are already available to Mueller. Remember, the transcripts were given to the Executive Branch for declassification review months ago. Mueller had access to Roger Stone’s transcript. When Mueller decided to press charges against Stone, the only stipulation for the Special Counsel was that they had to ask for another official copy of the transcript from the committee. The committee obliged and sent the second copy of the transcript to the Justice Department. So why is Schiff making this such a big issue? He’s showboating. He is being disingenuous when he tells media outlets that he wants to turn over the transcripts to Mueller because, as I’ve stated, he has access already. There’s a reason for this approach. Schiff is insinuating that the people connected to Trump, who were interviewed by the committee lied. It’s a way of keeping the Russia Trump collusion narrative alive and well. In his never-ending media appearances, Schiff declares that Mueller needs these transcripts to investigate possible perjury charges. In January, Schiff told CNN’s Jake Tapper that he wanted to send them to Mueller to investigate if any witnesses had lied to Congress. He has even named some witnesses publicly, for example, he questioned whether Donald Trump Jr. had perjured himself during testimony. 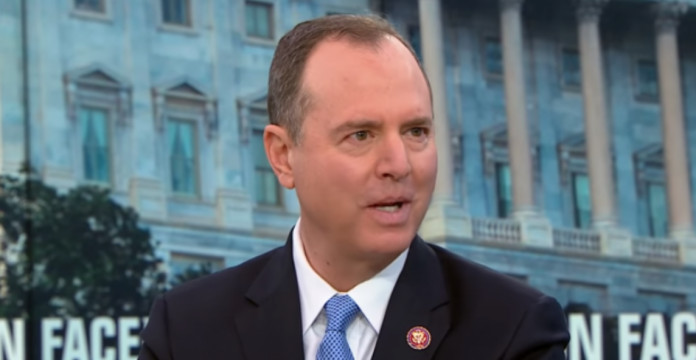 Schiff called out Trump Jr. in an interview in January with George Stephanopoulos on ABC’s ‘This Week.’ The Democratic chairman hinted that Trump Jr. may have lied to Congress about who he called on a blocked number around the time of the infamous Trump Tower meeting. He suggested that it may have been his father President Trump and that Mueller should investigate. Further, he had made the same insinuation in the past, but days after his appearance on “This Week,” it was proven false when a story by The New York Times revealed Trump Jr. was calling two close family friends. Making matters more interesting, Republicans today also put forward a motion to subpoena around a dozen witnesses. Those people, including officials involved in the FBI’s Russia investigation as well as people likely to be familiar with the compilation of the Steele dossier. Of course, those people may not say what the Democrats want to hear so the Democrats rejected the motion. It’s actually a brilliant idea – we need more interviews. I think the Republicans should pounce on this opportunity to question these witnesses. Hopefully, they will ask some poignant questions we still don’t have answers to. Who provided former British spy Christopher Steele with the salacious and unverified information in the dossier? That’s one question I’d like clarity on. “Since the Democrats previously sought testimony from these individuals, such as James Baker and Sergei Millian, we assume they still want to speak to them,” said Jack Langer, spokesman for committee Republican Rep. Devin Nunes. James Baker is the former FBI General Counsel who was close friends with former FBI Director James Comey. Baker is now the subject of a leak investigation. He reportedly accepted documents from Perkins Coie, the law firm used by the Democratic National Committee and the Hillary Clinton campaign to pay for the unverified dossier. And it would also be interesting to hear from Sergei Millian, who is widely reported to be an unwitting source of information contained in the dossier, which was compiled by former British spy Christopher Steele. These witnesses would surely have some interesting information to share if they were under questioned by the committee. I’m not sure it’s information that would benefit Schiff’s claim that there was collusion between the Trump campaign and Russia. But I’m certain it would shed light on what really happened with the dossier and the internal machinations of the FBI’s probe into the campaign. Republicans on the House Permanent Select Committee on Intelligence issued the following statement today on sending the transcripts of interviews from the committee’s Russia investigation to the Special Counsel’s office. Republicans are happy the Democrats are joining us in reiterating what the Republican-led committee already voted to do in September 2018—make all the transcripts available to the executive branch, including the Special Counsel’s office, as part of the process of publishing them for the American people to see. In light of the unacceptable delay in the Director of National Intelligence’s declassification review, we hope the Democrats will now join us in further increasing transparency by voting to immediately publish all the unclassified transcripts that we previously sent to the executive branch. Additionally, we call on our Democratic colleagues to grant our request to subpoena numerous witnesses whose testimony the Democrats had previously sought in connection with the committee’s Russia investigation.